Vijaylaxmi gets up 6 am every morning, switches on the geyser and steps into to kitchen to start preparing for her son’s lunch box. “Venkatesh is the apple of her eye. There is never a day when his tiffin is packed with a dish he does not like. He too is very picky like my son," says Vijaylaxmi’s mother-in-law. “We lost him 10 years ago. This family lost a father, son and a husband, but it was Vijaylaxmi who stepped up to carve a future for Venkatesh with joy and happiness.” Earlier in November, this family went through a similar emotional and financial turmoil. Venkatesh was supposed to join school after Diwali holidays. A fever and spiking temperatures caused him to skip his classes. Soon the prolonged illness alarmed Vijaylaxmi. She rushed 13-year-old into Deepak Hospital, Bangalore. This mother and son survived of 25 days struggle of hospitalization with sheer resilience and faith. 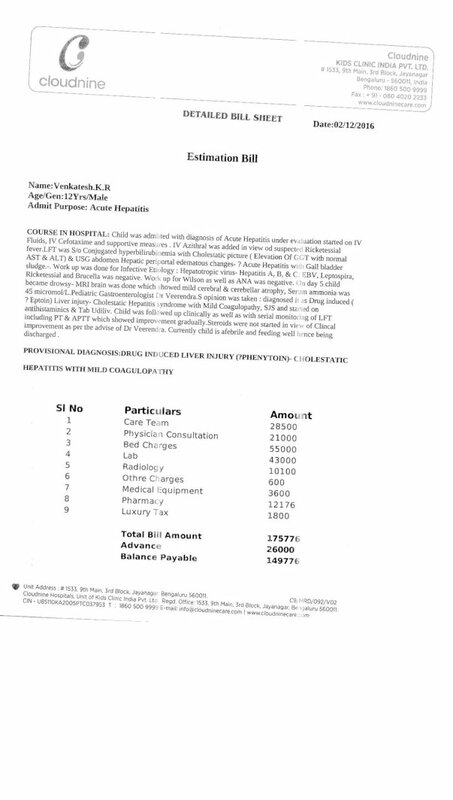 At first, doctors said Venkatesh showed symptoms of viral infection, but he did not respond to the medication. Later, he was diagnosed with dengue. A low platelet count further aggravated little Venkatesh’s condition. After various consults and multiple hospital visits, Venkatesh was all set to be discharged. “He was very excited to go back to school. I too was relieved to know my nights in the hospital were coming to end. But little did I know that I had to see my dear son fight for his life again.”, Vijaylaxmi said as her eyes well up thinking of the painful days. Venkatesh developed rashes on his hands, and the fever came back. He stopped eating and refused to take any fluids. He was immediately rushed to Cloud Nine Hospital, Bangalore. After running multiple tests, it was confirmed that Venkatesh’s liver was injured due to the heavy doses of drugs used to cure him of his previous ailment. He was immediately admitted for surgery. Today, Venkatesh is a home recovering. If all goes well, he will soon be able to go to school. Although her son is home safe, Vijaylakshmi's worries are mounting with piling medical bills from the past month. She has given all she can, to settle the expenses, and is still struggling to cover the costs. “Everyday, since I have been discharged, my mother is constantly on the calls or busy with bank visits. Many relatives come home to supposedly check on me. But I am not deaf to hushed voices asking my mother to return their borrowed money,” says Venkatesh who feels helpless to watch his mother go through this financial crisis alone. Vijaylaxmi is a single mother. She has exhausted all her savings to settle bills worth 6 lakhs. There is a pending bill of 1.5 lakh which needs to be settled urgently. 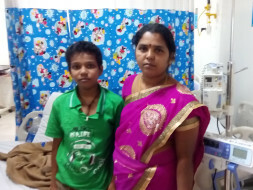 Vijayalakshmi has ensured that her son has not missed even a single test or follow-up because of lack of funds. It is her sheer grit, that Venkatesh is home today. Today, this son pleads for your help to put his mother’s struggles at ease. Your support can help Vijaylaxmi settle the bills worth 1.5 lakh and free her of this financial burden. I am Debotri, a fellow at Milaap. Here is an update on Venkatesh. Vijayalakshmi still remembers those days when she struggled hard all by herself to make him lead a normal life. But now, fortunately, like the saying, every cloud has a silver lining, things are good with them as well. Venkatesh has resumed to school and he is extremely excited about it. We will soon post pictures of him going to school. Thank you once again, donors, for your support. I shall pray for the child. God Bless the mother!